a running & walking club for LGBTQ people and their friends. Stockholm Frontrunners is a running & walking club for LGBTQ people and their friends. Everyone who shares our values is welcome to join us. We meet every Tuesday evening and Saturday morning at Zinkensdamms IP. 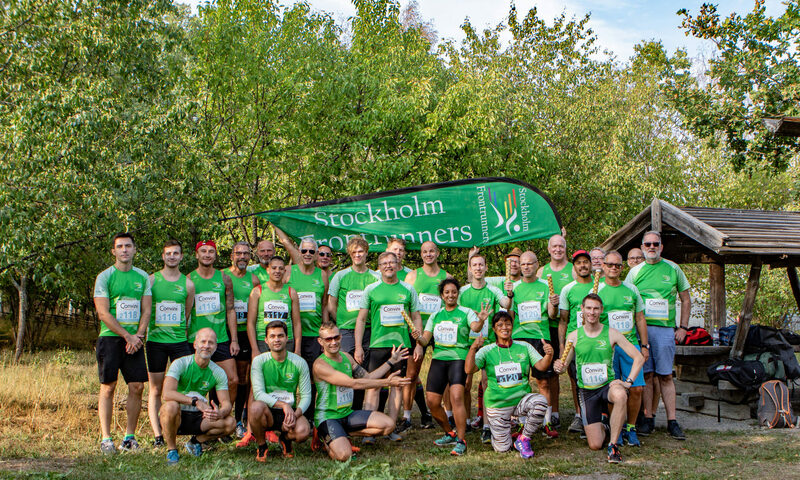 Stockholm Frontrunners is a running & walking club for LGBTQ people and their friends. Everyone who shares our values is welcome to join us. We meet every Tuesday evening and Saturday morning at Zinkensdamms IP. Membership fee should be paid after training with us three times. Meeting place: Zinkensdamms IP entrance (the entrance nearest Zinkensdamm metro), Ringvägen 16. You can leave a change of clothes and valuables at the Zinkensdamm Hostel reception. On Tuesday evenings we normally do intervals of various distances. We often grab a beer or bite to eat afterwards. On Saturdays it is social running. We run ca 5-12 km divided in groups with different distances and paces. Afterwards we meet at Zinkensdamm Hostel Restaurant/Cafe in Tantolunden (Zinkens Väg 20, 117 41 Stockholm) to socialise. Coffee, beer, sandwiches are available for purchase as well as a brunch menu. If the weather is nice we will sit outside. There is also a walking group for those who prefer to walk instead. We always begin and end running with group stretching. Come and run, jog or walk with us! 2018 membership fee (SEK 200). (Students, pensioners, unemployed SEK 150). Membership fee should be paid after training with us three times. Please write your name when making a payment. The training schedule is an overview of forthcoming training sessions that are designed to accommodate both the beginner and the experienced runner. Training usually consists of a warm-up, stretching and some running specific exercises followed by the planned training session. Tuesdays evenings: we focus more on technique and speed, with options to suit your level. Interval training is also seen as a social activity that keeps the group together. Saturdays: generally more designed to help improve the baseline with less focus on speed. Usually there are different start groups, based on distance and speed. More socially-focused training. Afterwards, we have coffee and/or brunch together. We rent a changing room with showers and a sauna at Zinkensdamms Hotell. You can leave a change of clothes here. The use of the changing room is free of charge for members. Only Stockholm Frontrunners has access to this changing room during our training sessions, but do not leave your valuables in this room. You can leave any valuables (keys, phone, money, etc.) at the hotel reception desk. Bring your own towel to use the shower and sauna. On certain occasions we may not have access to the changing room due to a conference at the hotel. Everyone is welcome, whether they are beginners or experienced runners! Stockholm Frontrunners thank you for wanting to become a member. Take the plunge and find your form! Have you thought about to starting to run but are unsure about how to do this, or are you just looking for something new? Perhaps you’re looking for a new fun way to exercise and want to know about what we can offer you? At least 100 training sessions per year. Interval training and social running. Training coach and exercise advice. Opportunity to buy into club clothes. Opportunity to travel to other cities to participate in races. We often meet up with other frontrunners clubs when on trips. What do we use your membership fee for? Membership to the International Frontrunners. Hire of premises for social activities and purchase of decorations and plates, etc. Fee for bank account and swish. Fee for website and address. Purchase of beach flag, banner, and the like. Our training sessions last about one hour. We always meet at Zinkensdamms IP (Zinkendamm metro) unless we announce any changes. Check under News or on Facebook.